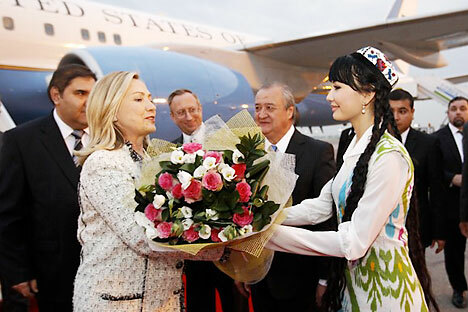 In October Hillary Clinton went on tour to Central Asia. This visit is one of steps towards Shanghai Cooperation Organisation. Source: Reuters. This autumn, the United States has stepped up its foreign political efforts in Central Asia. On 22 September, Congress voted to lift restrictions on military aid to Uzbekistan, in effect since 2004. In October, Secretary of State Hillary Clinton went on tour to Central Asia, visiting Pakistan, Afghanistan, Tajikistan and Uzbekistan. The policy focus was on 1) enhancing cooperation to stabilise the situation in Afghanistan and 2) the development prospects in the region after NATO troops pull out of the country in 2014. Top of the agenda for international experts were the talks between Hillary Clinton and Uzbekistan President Islam Karimov, held on 22-23 October. The avid interest shown by the United States in interaction with the Shanghai Cooperation Organisation (SCO) is evident against this political backdrop. American analysts called for expansion of the U.S. cooperation with the SCO back in the summer. In October, the Barack Obama administration was reported to be considering embarking on talks with the SCO to define a format for cooperation. American diplomacy has two options in mind. The first envisages observer status for the U.S. within the SCO. The second would provide the U.S. with the status of partner in dialogue with the organisation. Washington expressed its interest in interaction with the SCO as soon as American military bases were deployed in Central Asia. In 2002, the George W. Bush administration probed for a chance for the U.S. to accede to the SCO or gain the status of associate member. The White House proposal almost led to a crisis in the SCO. Uzbekistan endorsed the U.S. proposal, China rejected it, and Russia and Kazakhstan wanted to preserve the integrity of the organisation while avoiding disputes with the Americans, who were then engaged in the war with the Taliban. Washington failed to partner with the SCO at that time. The reason was the tough policy of the Bush administration towards the Central Asian countries (manifested in severe criticism of the Uzbekistan authorities for the crackdown on the Andijan armed riots in May 2005). The new U.S. administration must have taken the mistakes made by their forerunners into consideration. Washington has worked out a package of measures to enable the U.S. to join the SCO initiatives. First of all, the White House wants access to the political decision-making process within the SCO. Partner in dialogue status does not envisage access to classified documents of the organisation, though a partner can familiarise itself with the documents by addressing a request to one of the SCO member-states. The possible restoration of the U.S.-Uzbek partnership might provide the basis for this practice. Second, Washington supports the projects for extending the list of the SCO partners. The U.S. endorses the 21 October application filed by Turkey and calls for integration of Pakistan and India into the SCO (both actively cooperate with the U.S. in the military and technical sector). Third, the U.S. is looking to change to a selective partnership practice with Central Asian countries. Washington is poised to restore the military and political partnership with Uzbekistan on privileged terms. Yet Clinton’s visit to Dushanbe was to show the White House’s willingness to embark on a dialogue with Tajikistan. U.S. experts also bargain on the appreciation of the Kyrgyz elite. (During the May 2010 crisis, the Obama administration opposed bringing foreign troops to Kyrgyzstan). The U.S. might also step up its partnership endeavor with Kazakhstan. Astana has been put on alert by the strengthening of Uzbekistan and is ready to seek a partner to counterbalance Tashkent’s growing influence. The U.S. efforts are capable of modifying the SCO’s very nature. The organisation was originally founded in 2001 as a system for ensuring regional security based upon the fundamental principles established by the Russian-Chinese Joint Declaration on a Multipolar World (1997) and the 2001 Sino-Russian Treaty of Friendship. The two documents postulate the inviolability of sovereignty and territorial integrity, respect for the right of each party to select its own development path and mutual support in the struggle against separatism. Those principles were a response to the U.S. concepts of “expansion of democracy” and “regime change”. The United States does not mind cooperating with the SCO in some specific domains but the White House would like to see a different SCO, one in which the Americans would shape decision-making. In this context, the U.S. efforts are aimed at undermining the SCO rather than strengthening it. The SCO might confront the same dilemma in which it was caught back in 2002. The dialogue with Washington is indispensible for enhancing regional security in Afghanistan and Pakistan. Yet most of the SCO member-states are concerned about the U.S. gaining access to the SCO decision-making mechanism. So Moscow and Beijing will have to address a matter of principle: how to build up a dialogue between the SCO and the U.S., while Washington is interested in having a dialogue with Central Asian countries bypassing Russia and China?